The picture is old, but the content is recent on NYMetroParents.com, featuring my latest story about James’ favorite place to rock out. Click here for the full article. DMF Fall Events – You’re Invited! My absolute favorite season is the Fall, which brings along with it one of our all-time favorite activities – DMF. This season Daniel’s Music has some amazing activities and opportunities lined up – the first couple are listed below. If I wasn’t due so soon I would totally take on that 5K… hope to see you there regardless, though! Hope all is well! We hope that you will be able to join us for some (or all) of our upcoming events. Please know that we appreciate your continued support and participation and hope to see you soon (and often)! We have known Kathy Lord and Susan Weber (Founders of Music That Heals) for many years; they played music for Daniel in the hospital when he was emerging from his coma back in 1997 and performed at DMF’s very first Music Appreciation Event on February 26, 2006. So it gives us tremendous pleasure to now be collaborating with Kathy and Susan and Music That Heals for its Annual 5K Race in Prospect Park. It will be a fun day with awards, medals, goodie bags and wonderful camaraderie. There will also be a PeeWee Race at 11:00AM for ages 12 and younger. Plus, DMF will also be singing the National Anthem to start the race! We have had a wonderful relationship with Yamaha, since Daniel met Lori Frazer, current DMF Board Member, at an AARP convention in September 2008 (no Daniel is not 50 but he knows people who are). The bond has strengthened through the added participation of Dr. Barry Bittman, CEO of Yamaha Music and Wellness Institute (also a DMF Board Member) and Bonnie Barrett, Director of Yamaha Artist Services here in NYC. Yamaha Artist Services has arranged a special concert at their Piano Salon at 689 Fifth Avenue, 3rd Floor, with extraordinary jazz pianist and composer, Jeff Franzel, who has performed alongside such legendary entertainers as Frank Sinatra, Sammy Davis Jr. and Mel Tome. His original songs have been written for and performed by artists as diverse as Josh Groban, Placido Domingo, Clay Aiken and N’Sync. The evening promises to be intimate and inspiring with wine and hors d’oeuvres and a special performance of Hear My Voice by the DMF Voice Technique class. or call the DMF office at 212.289.8912. Credit card payments accepted at click here or checks can be made payable to Daniel’s Music Foundation, c/o The Trush Family, 1641 3rd Ave. #21A, New York, NY 10128. You’re Invited To A Special Musical Event on May 20, 2012 – Reserve Tickets Now! Once again, DMF concert season is upon us. I cannot recommend this event enough, and whether or not you have a special needs loved one in your life, this is a “must attend” at least once if you live in the city. Details on tickets and concert times (two to choose from) can be found below in a message from the Trush family. We hope all is well and that you are enjoying the beautiful spring weather! Please RSVP if you will be able to attend by using Eventbrite – http://dmf-rock-and-roll.eventbrite.com/ or if you prefer, contact us at daniel@danielsmusic.org or 212-289-8912. As always, many thanks for being part of the DMF Community! We hope to see you on the 20th! Reminder: DMF “Season to Smile” Is Tomorrow – Last Chance to Reserve Tickets! 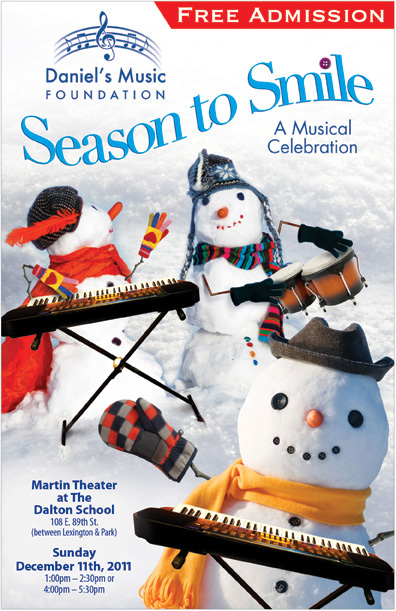 I hope you will be able to join us tomorrow at the DMF Holiday Concert (we’ll be at the 1pm show)! Please make sure to use eventbrite to RSVP and note that there are two times to choose from. Though admission is free you should reserve a ticket because space is more limited every year (not surprisingly!). I can’t recommend this event enough – look up “holiday spirit” in the dictionary and you’ll find this show! We hope all is well! Please RSVP if you will be able to attend by using Eventbrite – http://www.dmf-season-to-smile.eventbrite.com/ or if you prefer, contact us at daniel@danielsmusic.org or 212-289-8912 and share in the “Season to Smile” by inviting your friends and family to attend (just let us know so that we can keep track of the number of attendees)! As always, many thanks for being part of the DMF community! NYC Holiday Top Ten Event – DMF “Season to Smile” is December 11th! One of my Top Ten favorite holiday activities in NYC (see Top Ten posts for more ideas) is coming up on the 11th and I hope you will be able to join me! Please make sure to use eventbrite to RSVP and note that there are two times to choose from. Though admission is free you should reserve a ticket because space is more limited every year (not surprisingly!). I can’t recommend this event enough – look up “holiday spirit” in the dictionary and you’ll find the DMF Winter concert! Wishing you a wonderful holiday and we hope to see you on the 11th! The First Foorce Contest Is Finally Here!! Where is the summer going?! Ironically, I have found myself with less time than usual during the past couple of months – between catching up with doctors’ appointments while school is out (11 down, 4 to go), shuttling kids to swimming, track, gymnastics, and playgroups, family vacations and of course, Foorce events, my calendar has turned into a scribbly, blackish smear instead of the neat and organized list I so adore. So it’s Saturday afternoon and we just got back from a really fun time at Bounce U (I highly recommend for special needs and typical children) – my MO is to post in the wee hours of the night, but because of the amazingly good time we have shown our children (and because they are otherwise occupied for the moment) I do not feel guilty taking a minute to get this contest started! Okay, it’s now Sunday morning… as you can see, I live in a time warp. strength; energy; power; any body of persons combined for joint action. It’s one of the definitions for “force” that I felt described the kind of force I wanted my blog to be full of. And, I was getting a lot of emails at the time and really felt the need to get the site going, slogan or not. So, like other posts that have been done in the midst of chaos or under time-pressure, looking back at the slogan I began to feel that it was “not quite right.” The more I looked, the less I liked. More readers looking, even less liking. I have received numerous compliments on my catchy blog name. Unfortunately, I can take very little credit since my last name was the creative inspiration. If my last name had been “Smith” or “Jones” I would probably be holding a contest for a blog name, too. That’s where you come in. I need a new, catchy slogan. One that I could put on a business card that would help describe the type of blog thefoorce.com is. It should be something to do with the word “force,” though force doesn’t have to be in the actual sentence. There are lots of popular “force phrases” to get you started: “force to be reckoned with,” “use the Force,” “force multiplier,” “driving force,” etc. You can tell I’ve been brainstorming :), though not very successfully. The contest starts now and will go through October 1st, 2011. You can submit as many ideas as you like. The top 3 slogans will be placed in a poll on this site from October 1-31, 2011. At the end of October the phrase with the highest number of votes will win 1st place and will replace the slogan on this site. The top 3 slogans will all receive a prize (see below for details). To submit an idea to the contest, email me at msearfoorce@gmail.com with your name, a way to contact you should you win, and your slogan/catchphrase. The subject of your email should be FOORCE SLOGAN CONTEST SUBMISSION. Because of the high volume of emails I have been receiving lately, it is important to put this line in your subject heading so that I don’t mistakenly overlook your submission. I solemnly swear not to enter any of my own ideas into the contest to try and win one of these prizes (though I seriously want to)! Instead of 1st, 2nd and 3rd place prizes, 1st place will get to pick from the prizes (listed below) first, 2nd place will pick between the two prizes that are left and 3rd place gets the remaining prize. The prizes listed below are not in any particular order. Though this book says “Early Intervention” in the title, I’m seriously thinking of ordering it for my 10 yr old because the “games” seem like great ideas 1) to work on some of his phobias, 2) to try new skills in a silly and subtle way and 3) to play with James and his younger siblings at the same time. As you can see when you click the link above, the book gets great reviews and is geared toward a wide variety of children. However, if this book doesn’t seem like the right fit for your child(ren), our donor has generously offered to provide a copy of Attention Games instead. Thank you, Amazon! DMF continues its AAA trend (All-Around Awesomeness) by donating bunch of great items to my little contest. The prize includes a DMF tote bag, hat and umbrella. Like its founders, Daniel’s Music Foundation items are attractive and high quality, and promote an incredibly worthy cause in NYC. Something Special Magazine is a publication geared toward parents raising special needs children. I looked through some back issues (available online) and was thoroughly impressed at the high quality and relevance of the articles – I’ve always been on the lookout for a Parenting-type of magazine that was actually pertinent to James, and this definitely fits the bill. The creator and editor, Katrina Laygo, has five children, one with autism (I thought I was busy!). She not only runs this amazing publication but recently started Georgia’s first Higher Education Scholarship Fund for graduating seniors that have a diagnosis of autism or cerebral palsy, the Nathan’s Something Special Scholarship Fund, INC. I have high hopes and look forward to finding a great new slogan for The Foorce!! Maureen on Breaking News: Missing NYC Woman Rumored To Be Seen Crying In A Walmart Parking Lot. In a minivan.